New marine geophysical data along the Macquarie Ridge Complex, the Australia-Pacific plate boundary south of New Zealand, illuminate regional neotectonics. We identify tectonic spreading fabric and fracture zones and precisely locate the Australia-Pacific plate boundary along the Macquarie Ridge Complex. 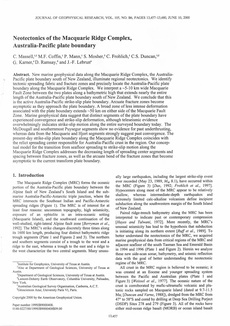 We interpret a ∼5–10 km wide Macquarie Fault Zone between the two plates along a bathymétrie high that extends nearly the entire length of the Australia-Pacific plate boundary south of New Zealand. We conclude that this is the active Australia-Pacific strike-slip plate boundary. Arcuate fracture zones become asymptotic as they approach the plate boundary. A broad zone of less intense deformation associated with the plate boundary extends ∼50 km on either side of the Macquarie Fault Zone. Marine geophysical data suggest that distinct segments of the plate boundary have experienced convergence and strike-slip deformation, although teleseismic evidence overwhelmingly indicates strike-slip motion along the entire surveyed boundary today. The McDougall and southernmost Puysegur segments show no evidence for past underthrusting, whereas data from the Macquarie and Hjort segments strongly suggest past convergence. The present-day strike-slip plate boundary along the Macquarie Ridge Complex coincides with the relict spreading center responsible for Australia-Pacific crust in the region. Our conceptual model for the transition from seafloor spreading to strike-slip motion along the Macquarie Ridge Complex addresses the decreasing length of spreading center segments and spacing between fracture zones, as well as the arcuate bend of the fracture zones that become asymptotic to the current transform plate boundary.